Burial Espenscheid Cemetery, Sodus, Wayne Co., NY, USA, "Dearly loved and early lost"
(Benjamin G. member of Co. C, 160 Regt.) "We loved him"
Benjamin G. Houghton married Margery A. Williams. Daniel Gillman Houghton married Minerva Gale in Apr 16, 1845 at Tippecanoe, IN, USA, JWH: 25 May 1844. Daniel Gillman Houghton married Blondine Westbrook in Aug 15, 1881 at Hunts Station, NY, USA. 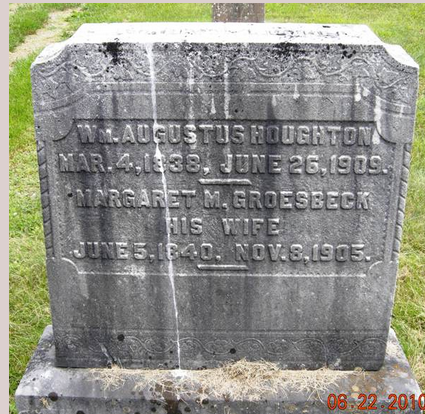 William Augustus Houghton married Margaret M. Groesbeck in Mar 14, 1861 at Buskirks Bridge, Washington Co., NY, USA, mar 38 years in 1900 census. Uriah Houghton married Electa Clark. Blondine Westbrook married Daniel Gillman Houghton, son of Simeon Houghton and Lois Thorpe, in Aug 15, 1881 at Hunts Station, NY, USA. 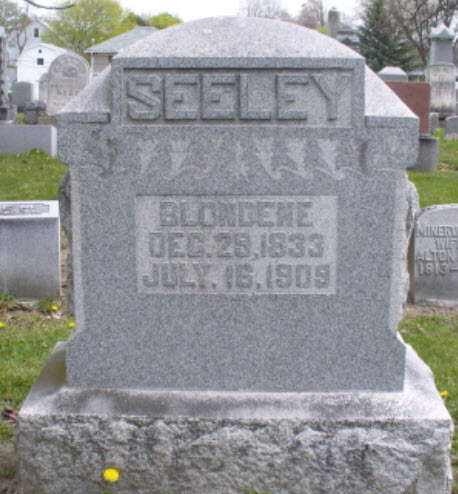 Blondine Westbrook married Samuel F. Seeley. Julia A. Houghton married Reuben C. Chase in Sep 30, 1862 at Mt. Vernon, OH, USA. Lester H. Houghton married Viva A. (?) in circa 1884 Mar 16 y in 1900 census. Reuben C. Chase married Julia A. Houghton, daughter of Madison Houghton and Sarah King, in Sep 30, 1862 at Mt. Vernon, OH, USA. Joseph Houghton married Annie M. Hubbard in Apr 29, 1863 mar 46 y in 1910 census. Annie M. Hubbard married Joseph Houghton, son of Joseph Houghton and Maria Seaver, in Apr 29, 1863 mar 46 y in 1910 census. Henry Pattridge married Susan Elizabeth Newton, daughter of Joel Newton and Elizabeth Jewett. Alvin Jewett Johnson married Lucia H. Baldwin. Eli Houghton Johnson married Lovica Cole. Laura Maria Johnson married Willard Graves. Adelia M. Johnson married Alonzo Dickerman. Willard R. F. Johnson married Sarah Graves. Henry C. Johnson married Bernice White. Susannah L. Johnson married F. C. Brown. Cynthia C. Johnson married W. Wood.